Once the ancient jump lane network was discovered, it was only a matter of time before its secrets were unveiled and interstellar colonization became practical. As Marshal of the Fleet, it is your sworn duty to oversee the exploration and conquest of nearby regions of the galaxy; to ensure the perpetuation of your culture at any cost. But your race is not alone in the cosmos, nor in its mastery of jump lane travel and aspirations for dominance—not alone in having both the power and the will to realize those goals. Tiny surveyor jumpbots are sent out in all directions. Most paths are dead ends, but sizable deposits of rare minerals are detected along paths generally leading toward the galactic center. These crystals can be refined into the precious jump fuel that drives your space fleets onward. Soon, a trail of colonies leads out from your HomeWorld, and soon the races converge on the same cosmic regions. Only you can determine the fate of your people, be it interstellar conquest or infinite servitude. "The artwork is beautiful; the space ships are cool...cooler than plastic." "Customizing these space ships is something fun." "A lot of neat cards and concepts in the game." "As a 4 player game, very tight. A good 2 hour game." "Right out of the box, the player can see that StelCon is something new and different." "Well-designed, sturdy maps and pieces; innovative game design; high replay value." Back of the box shows 6 player config. Q. What's the game like? A. It's unique, which makes it fun and also a challenge to describe. StelCon: Infinity is a turn based, light strategic war game that has many 4X elements. 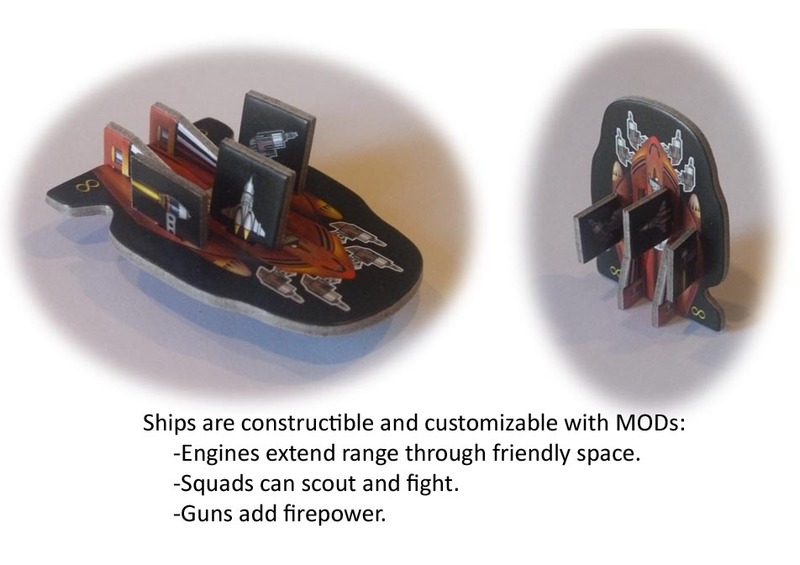 Players cycle their hand of "Conquest cards" fairly quickly so they can temporarily or permanently modify space ships, the outcome of an individual battle or card exchange, and the sectors that your fleet conquers (i.e. everything in the game). Many cards can be played at any time which keeps players involved when it's not their turn. The deck of 119 Conquest cards provides tons of "take that" moments, making each game a unique experience. 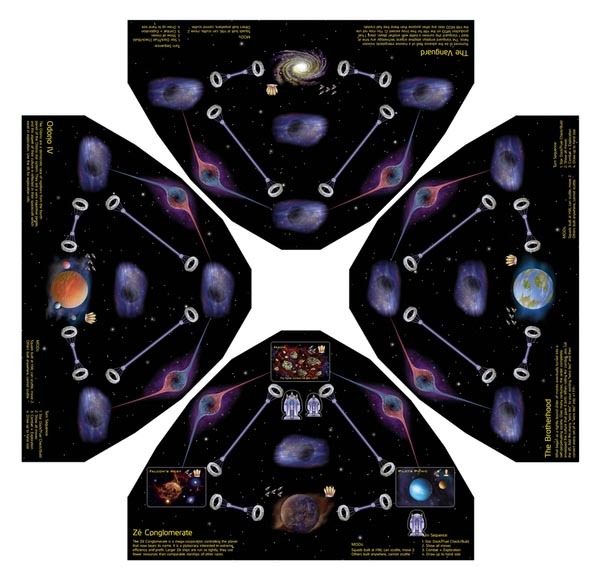 The map is a point to point shell that the players fill in with one of 51 sector cards as they explore, making the map both the same and different every game (shape/content). The elegant map design makes every player equidistant from all opponents' homeworlds, meaning there are no natural allies. The constructible/modular design of the space ships is FUNctional and just super cool. Games last around 30-45 minutes per person. StelCon: Infinity plays 2-6 players, and player elimination triggers the game's immediate end. The 6 player version pits 3 teams of 2 against each other, with teammates playing simultaneously to minimize time between turns. Q. Where can I get more info on this game? A. You can find a descriptive video and photos at the Kickstarter page. 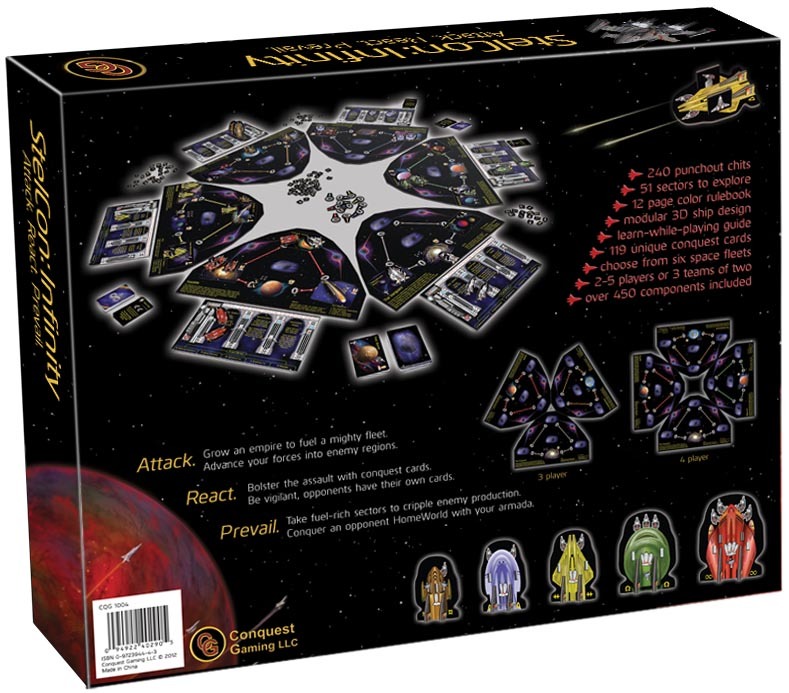 More information and another video can be found at the BoardGameGeek. An interview about StelCon and Warlords can be found here at Bring Your A Game.